Who doesn't love a hot cup of coffee in the morning? I certainly need my fix. 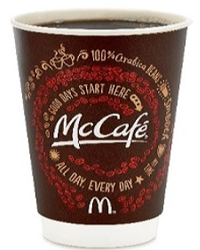 :) Well, from now until 9/29, you can get a FREE Small McCafé Coffee at McDonald’s! No coupon needed...just free free free! :) Enjoy!